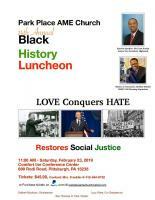 For the past 14 years, Park Place A.M.E. Church has been celebrating Black History Month with a signature luncheon. The purpose of the luncheon is to reflect on our history, while acknowledging members of the community who are working to achieve the goal of bettering the lives of African Americans today and the future. This is meant to recognize the contributions of members of the community, church, business leaders, and media that elevate and improve lives. This year the keynote speaker is Evan Frazier, the Senior Vice President of Community Affairs at Highmark. The Master of Ceremonies will be Brother Marlon, host of Gospel Inspirations on WAMO. For tickets, contact Mrs. Franklin, 412-464-9732 or purchase tickets on paypal.com at parkplaceamechurch@gmail.com .